For the ninth time in a row, Heimtextil in Frankfurt am Main (8-11 January 2019) sees an increase in the number of exhibitors. ‘Despite the economic downturn, Heimtextil is continuing its extremely positive development. With 3,025 exhibitors from 65 countries, Heimtextil has a stronger and more international slant than it has had for 15 years’. It is thus further consolidating its position as the world’s leading trade fair for home and contract textiles’, says Detlef Braun, Member of the Executive Board of Messe Frankfurt. 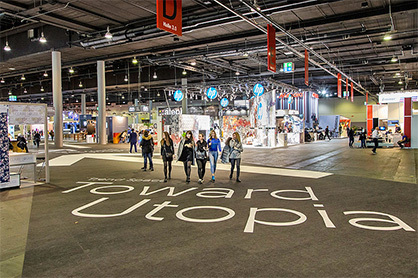 Heimtextil will launch the 49th edition of its trade fair with a new concept and the top themes of architecture, hotels, sustainability and sleep. ‘As part of the fundamentally revised concept, we have combined themes and product segments in an even better way for specific target groups. Visitors can thus benefit from new synergies, shorter distances and lots of furnishing inspiration’, says Braun. In addition to a globally unique design show with international market leaders, a high-calibre event programme with notable guests and renowned industry experts supports the four-day trade fair. Based on an IFH study, Heimtextil has published a new Management Report in cooperation with the trade fairs Ambiente, Tendence, Christmasworld, Paperworld and Creativeworld. It gives a current overview of structural change in the German retail sector. Domestic consumption increased online and offline in 2017 to 595 billion euros (plus 4.2 per cent). However, the perception in the stationary retail trade is that the clear winner is online retail. For many retailers, the time has come to rethink their business concepts as part of the march of digitalisation. The route to success in this respect can be to use services and high-quality design in shops to turn shopping into an experience. At the same time, retailers are increasingly focusing on multi-channel concepts. Heimtextil supports retailers by offering innovative concept solutions for the point of sale and inspiration for experience-based business models. The inspirational heart of the fair is the new Heimtextil ‘Trend Space’ in hall 3.0. With the title ‘Toward Utopia’, it provides a preview of the design developments of the 2019/20 season as conceived by London’s FranklinTill Studio and staged by the Frankfurt studio Markgraph. As part of the new Heimtextil concept, the design show will be in close proximity to international textile designers, CAD/CAM suppliers and digital printer manufacturers. Heimtextil is thus bringing the progressive themes of trends, textile design and digital printing together on one hall level, creating an area full of inspiration and future technologies. As part of the ‘Interior.Architecture.Hospitality Expo’, Heimtextil will be presenting solutions for textile contract furnishing in hall 4.2 that are individual, sustainable and functional, from textiles with acoustic function or special abrasion properties to modular carpets, sun protection and innovative wall coverings. The offer is flanked by the presentation “Carpet by Heimtex”, a joint promotion by the Association of the German Home Textile Industry. Here, visitors can experience high-quality textile floor coverings by leading suppliers especially for the contract sector. With product presentations, lectures and guided tours, the offer in hall 4.2 provides valuable impetus and is supported and made possible by experienced industry partners. This makes hall 4.2 the first point of contact for the target group of interior designers and hospitality experts. A total of around 500 exhibitors at Heimtextil will be presenting products specifically for the contract business. Heimtextil is integrating the lifestyle theme of ‘sleep’ with an attractive expert programme: with the title ‘Sleep! The Future Forum’, a new information area in the foyer of hall 11.0 will highlight the themes of science & digital, sport, the hotel industry and sustainability during the four days of the fair. In hall 11.0, international market leaders will present innovations from the ‘Smart Bedding’ product segment: Mattresses, bedding and sleep systems can be seen as well as the associated technology. Well-known companies from all over the world are on board, particularly from Germany, Italy, Spain, Scandinavia, Japan and Australia. Currently, the topic of water consumption in the textile industry and in particular the problems of micro and ocean plastics are increasingly coming to the fore, driven by a first-time agreement reached 40 leading fashion companies, associations and organisations at the World Climate Conference in Katowice. A number of Heimtextil exhibitors will also be presenting progressive solutions to this problem. Christian Fischbacher, for example, produces decorative and upholstery fabrics made from used PET bottles. Erfal also uses recycled PET bottles to produce sun protection systems. And MHZ tackles the issue of ocean plastic and uses it to produce the innovative Greenscreen Sea Tex fabric. Other pioneering companies are listed in the Green Directory, which is available free of charge at Heimtextil. In addition, the Green Village in hall 12.0 and lectures in the ‘Sleep! The Future Forum’ and themed tours provide valuable information on sustainability. The new trade fair concept is based on an optimised hall structure that extends over the entire exhibition site from hall 1 to the new hall 12 and offers a wider range of products from international industry players. In particular, the range of upholstery and decorative fabrics as well as upholstery and imitation leather has again been expanded. On its now six hall levels (4.0, 4.1, 4.2 and 1.1, 1.2 and 5.1), Heimtextil brings together around 400 international manufacturers and wholesalers. In this way, Heimtextil combines the world’s largest and most international range in this segment, thus creating the best order options for buyers from the upholstery industry, textiles editeurs and home textiles dealers. The ‘Window & Interior Decoration’ product segment, which Heimtextil will present in hall 8.0, is a new fixture for international trade, furnishers and interior decorators. Here, renowned suppliers of curtains, carpets as well as privacy and sun protection systems present their wares. Around 40 international textiles editeurs are also represented with their upholstery and decorative fabrics. Finally, the wallpaper manufacturers in hall 3.1 complete the product range for the interior decorator target group. Attractive product portfolios are available in hall 9.0 under ‘Beautiful Living’, including decorative cushions, blankets, plaids, table and kitchen linen and accessories. A special highlight at Heimtextil in hall 9.0 will be the ‘Beyond Beautiful’ showcase by Ushi Tamborriello in cooperation with Zoeppritz. In the new hall 12, which adds an architectural highlight to the Frankfurt exhibition centre, Heimtextil will present international suppliers of ‘Bed & Bath Fashion’. On level 12.0, renowned labels will present a modern lifestyle for the home and thus target high-volume buyers, boutique operators and upscale retailers. Level 12.1 will become the platform for the private label business and thus the point of contact for large-volume buyers and industry representatives.